'Desert Embroidery' OGB- (Mark Rogers by Donald Shepard, R. 1983). Seedling 68-7. AB, 22" (56 cm). Early midseason bloom. Standards champagne, lightly veined burgundy; Falls champagne, heavily netted reddish brown; small signal of golden brown; golden brown beard; slight fragrance. 'Aril Beauty' X 'Blue Gate'. 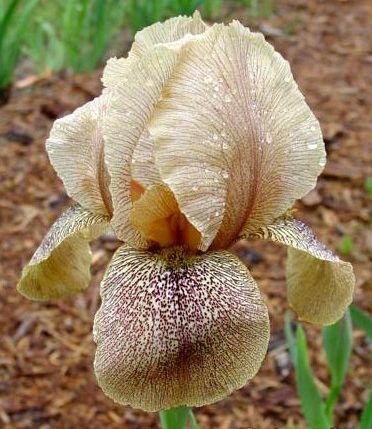 Shepard Iris Gardens, 1983.